Now it has to be said that acne isn't fun on any level. It’s pretty cruel when you’re a teenager. Yet it seems even more unfair as an adult when you have new wrinkles to deal with. Well that was me. I hit 35 and I had new friends on my jawline and neck. Now these were not your normal spots, they would take weeks to disappear and would be quickly replaced by others. Luckily for me after months of suffering and feeling self-conscious, I went back to my home town, where a friend came to the rescue and where I first heard the words adult acne! My friend Vick-Anne Kennedy took one look at me and said there was no need for anyone to have acne in this day and age. She had been working with Danné Montague-King, he had developed a wonderful skin-care brand called DMK. Within six weeks my skin had cleared. After dealing with this first hand, I introduced this treatment to several people in my industry. They were all overwhelmed by the results. So if you do live in the north of the country and are suffering with acne or any other skin complaints, you must visit Evolve Skin Clinic. For anywhere else in the country, DMK will direct you to your nearest clinic. So this is the background to the treatment: DMK offers an acne solution for all ages, skin conditions and genetic backgrounds. With over 40 years of research and experience in 30 different countries, DMK is one of the world’s leading providers of paramedical skin revision. Frustrated by the absence of a treatment for his own acne, Danné was inspired to create a solution with deep and long lasting results. By rebuilding skin, we rebuild lives. 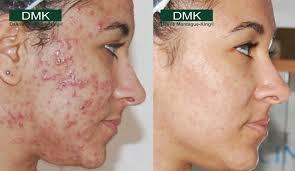 DMK Acne Solutions is a collection of successful techniques developed by DMK for revising acne. They are based on a natural healing approach using various modalities and botanical chemistry to restore skin functionality. A manual outlines the acne condition, its causes and types and how to diagnose it correctly. It provides an introduction to DMK products, formulated specifically for use on acne-prone skin, and the protocols and treatments used by DMK skin technicians that achieve optimum results. Understand and explain the origin and causes of acne. Diagnose different types of acne. Conduct treatments for different types of acne. Prescribe Home Prescriptive products designed to help resolve the acne condition.